← Baby Chicks are Back! Join us for our annual Pet Adoption and Information Fair to meet pets looking for loving homes. Discover more about animals and have some fun! 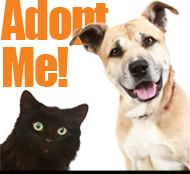 Qualified applicants can find their new best friend and give an animal a second chance at life. Snacks, drinks, face painting, balloon twisting, crafts, and more! This event is free and open to the public. Please note: no outside pets permitted. We are collecting new, unopened pet food, treats, clean blankets, towels, food bowls, etc. to donate to the shelters at the pet fair.